I guess we all have many and varying memories of that extraordinary few days in our lives back in October. When news came through from Paris that Munster head coach Anthony Foley had passed away in his hotel room overnight I guess it didn't register straight away. Certainly that was the case with me. What I was seeing and hearing was fact but somehow I couldn't believe, wouldn't believe, simply didn't want to believe that what appeared surreal was actually happening. Fast forward a few days to what Mick Galwey so accurately described as that 'great' funeral in Killaloe and it's from that wonderfully dignified send-off to Axel that the most pragmatic rugby memory remains. Now three months and some 10 or 11 matches on, it is the thought uppermost in my mind every time Munster take the field. Simply put, and given that I was positioned at that farewell ceremony alongside the current Munster players, I couldn't for the life of me even begin to comprehend how they could be in any rational state of mind to go out and perform against Glasgow in the Champions Cup down the road the following day. Well, they did and how. I have heard it argued then and since that the time has passed to move on. Easier said than done for the simple reason that Anthony Foley remains at the heart of everything Munster rugby stands for - and today in Paris will be no different. Bear in mind too the Ronan O'Gara factor. Rog and Axel were brothers in arms. The nature of the professional game demands a working relationship between out-half and No 8 but for the province's greatest ever exponents in their respective positions, it went way so much further and so much deeper than that. I mean if you think about it logically, Ronan could be gruff and moody while Anthony was quiet and reserved to the point of shyness . . . off the field at least. However, come kick-off time and the white heat of battle, two massive warrior hearts beat as one. Given the shock impact on the rest of us that Parisian morning, God only knows what extremes of emotion O'Gara was going through across town. Quite whether this afternoon's match will touch the same raw nerve I'm not so sure. I certainly hope not. What has changed in the interim is that just three matches in to Pool 1, Racing 92's interest in this competition is already at an end. And lest anyone thinks I am pointing a finger, or in some way questioning their Irish coach's commitment (or by extension that of head coach Laurent Labit), it's anything but. And yet it is immeasurably easier for O'Gara to prepare his team in the knowledge that it is not a win-at-all-costs mission for the aristocratic French. 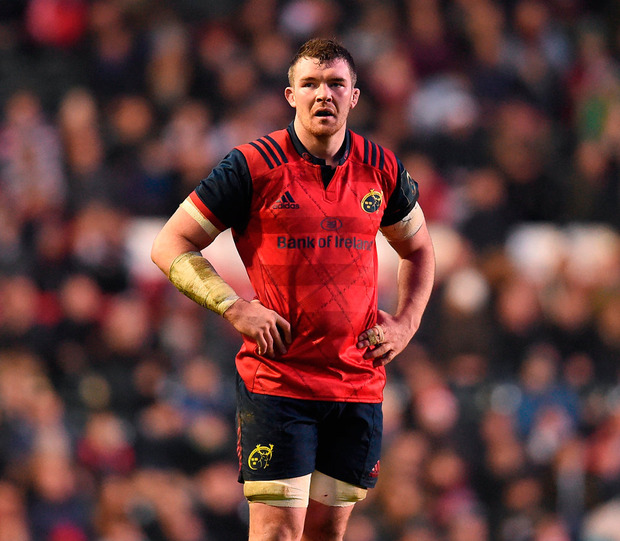 Wearing his professional hat, Peter O'Mahony has urged his Munster charges to channel their emotions into another winning performance. That, as we have seen over the last three months, is more than manageable. We dare not risk a parallel with Leinster but if Axel fitted the Michael Cheika bill then Rassie Erasmus, though not a back by trade, has provided the licence, much like Joe Schmidt upon his arrival in Dublin, for freedom of expression. Ian Keatley made reference to that aspect in midweek when referring to his match-turning cross-kick to Andrew Conway within metres of his own line in horrendous playing conditions in Galway last week. Despite Munster turning over the Leinster men in Limerick over Christmas, I still feel that Leo Cullen's squad (equally inspired by the arrival of enlightenment in the guise of Stuart Lancaster) is our most complete unit in terms of European winning potential. Even then I still suspect that Saracens and possibly Clermont or Toulon (really hope I am wrong on the latter) are that bit further ahead in terms of strength in depth. But for now it's one small step as critical European games come hot and heavy. Win today and it's off to Scotstoun for what is effectively the Pool decider in seven days' time. Though beaten by the hungrier team in Leicester (that was the most disappointing aspect), pool destiny is still very much in Munster's own hands - but winning in Paris today is critical. It could be described as a step back in time in the quest for winning the Munster way, the Foley way, the O'Gara way, but that will do just fine thank you very much. To that end, Erasmus has, not surprisingly, named a full-strength line-up minus the injured Darren Sweetnam and Jean Kleyn. Both have been in lethal form this season with Kleyn a veritable monster in terms of pure physicality of late. Simon Zebo has been a class apart at full-back but also as first receiver when the situation demands. He is surely now the main opposition to Rob Kearney for the green No 15 jersey if and when the Leinster man is fit and back firing. Anthony Tuitavake and Casey Laulala might present a new midfield pairing for Racing but the now-established Munster partnership of Rory Scannell and Jaco Taute knows only too well what Laulala on his own can do. And they too have that spark of creativity in the guise of replacement Francis Saili, plus obvious ball-carrying impact in Keith Earls, Jack O'Donoghue and Dave Kilcoyne off the bench when required. Racing have made wholesale changes as expected but it is still a formidable line-up with the presence of Dan Carter in reserve an indication of intent and I would like to think a mark of respect to Munster and to Foley. The flip side of squad rotation is opportunity for players on the periphery. That said, in terms of collective intensity the greater incentive has to be with Munster today. That should make all the difference and Munster can prevail in what is sure to be another emotionally-charged afternoon in the French capital.